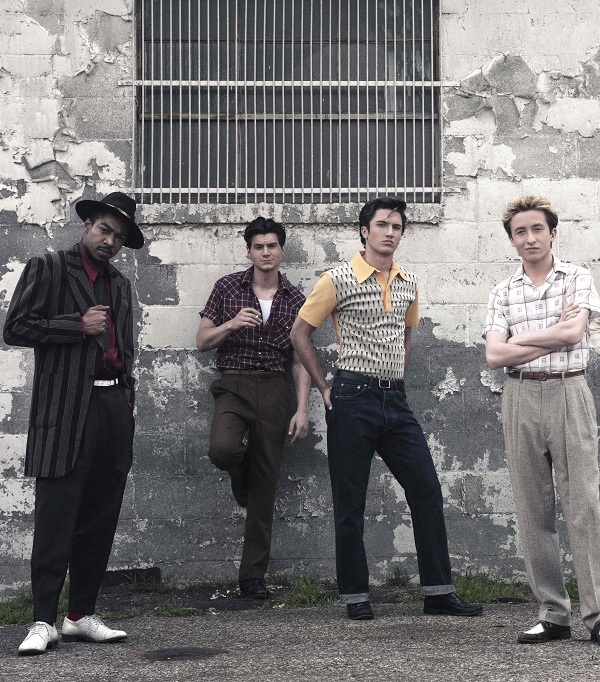 CMT has revealed a new title and premiere date for its upcoming limited eight part scripted series Sun Records, formerly known as Million Dollar Quartet and based on the Tony Award-winning musical, on Thursday, February 23 at 10 p.m. ET/PT. The announcement comes on the heels of the 60th anniversary of the historic Million Dollar Quartet recording sessions featuring Elvis Presley, Johnny Cash, Jerry Lee Lewis and Carl Perkins on December 4, 1956 at the Sun Records Studios in Memphis, Tennessee. Sun Records will join Nashville to complete CMT's new Thursday line-up. Set in Memphis during the tumultuous early days of the civil rights movement, Sun Records tells the untold story of nothing less than the birth of rock 'n' roll. Guided by Sam Phillips, young musicians like Johnny Cash, Elvis Presley, Carl Perkins and Jerry Lee Lewis combined the styles of hillbilly country with the 1950s R&B sound created by artists like Muddy Waters, B.B. King, Fats Domino and Ike Turner, and changed the course of music forever. The series chronicles these young artists' often jarring and sudden meteoric rise to fame in the face of sweeping political change and social unrest. The all-star cast includes Chad Michael Murray (Sun Records founder Sam Phillips), Billy Gardell (Presley and Arnold's manager, Colonel Tom Parker), Drake Milligan (Elvis Presley), Kevin Fonteyne (Johnny Cash), Christian Lees (Jerry Lee Lewis), Jonah Lees (Jimmy Swaggart), Trevor Donovan (Eddy Arnold), Keir O'Donnell (Dewey Phillips), Jennifer Holland (Sam's wife Becky Phillips), Margaret Anne Florence (Sam's assistant Marion Keisker), and Kerry Holliday (Ike Turner). Sun Records is a part of CMT's growing roster of scripted programming including the highly-anticipated new season of Nashville on Thursday, January 5 (following tonight's one-hour preview) and the second season premiere of Still The King starring Billy Ray Cyrus this spring. The network also recently announced the pilot His Wives & Daughters, including Jane Seymour, Gail O'Grady and Jeff Kober, will begin production this January. Additional scripted projects in development include a script order for a television adaptation of Varsity Blues. Sun Records is produced by Thinkfactory Media with Leslie Greif as executive producer, Gil Grant as executive producer and showrunner, Barry Berg as co-executive producer and Herb Nanas and Colin Escott as producers. Oscar nominee Roland Joffé directs, with Jayson Dinsmore and Julia Silverton as executive producers for CMT. The series is based on the musical written by Floyd Mutrux and Escott, with original concept and direction by Mutrux. Casting done by Fern Champion and Sharon Lieblein.